Take advantage of fresh peaches while they are in season. 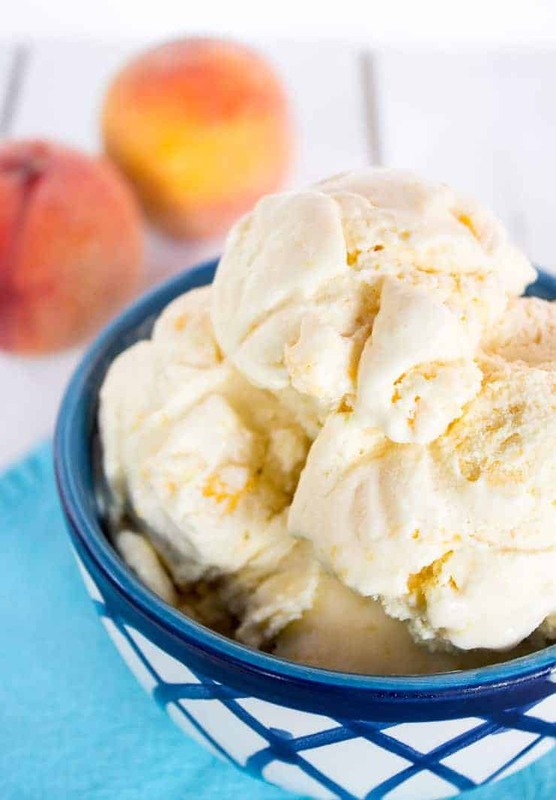 This Old Fashioned Peach Ice Cream captures perfect peach flavor. We can’t grow peaches here. Our winters are too cold. Luckily we have a Peach Man that brings fresh peaches and other fruits to our town. The Peach Man is a fruit stand named…..The Peach Man. I don’t even know who the Peach Man is. But every summer the fruit stand opens up and fresh fruit (more than just peaches) are sold. They mainly carry apricots, cherries, and peaches! We stopped this week and bought peaches. I had to make Old Fashioned Peach Ice Cream. It is old fashioned because it is made with a custard, and churned. There are a lot of great no-churn ice creams out there, but I’ve got to admit….I still love old fashioned churned ice cream! This isn’t my first attempt at making peach ice cream. Last year I cut up a bunch of fresh peaches and dumped them into the ice cream custard and churned away. It was good…but not great. The fantastic peach flavor was lacking. It was almost like all the fresh peach flavor was just sucked out of the peaches and disappeared. I knew I needed to try a different approach. The second time I cut up all the peaches and put them into a bowl with a bit of sugar. I let them sit for a couple of hours. The sugar helped release a lot of the juices from the peaches. When it was time to churn, I strained the liquid off the peaches and added it to the custard. Then during the last couple of minutes of churning, I added the actual peaches. Can you say PERFECTION???? Yep! All the fresh peach taste and delicious ice cream! How do you peel a peach? Use a paring knife and remove peach peel or skin. 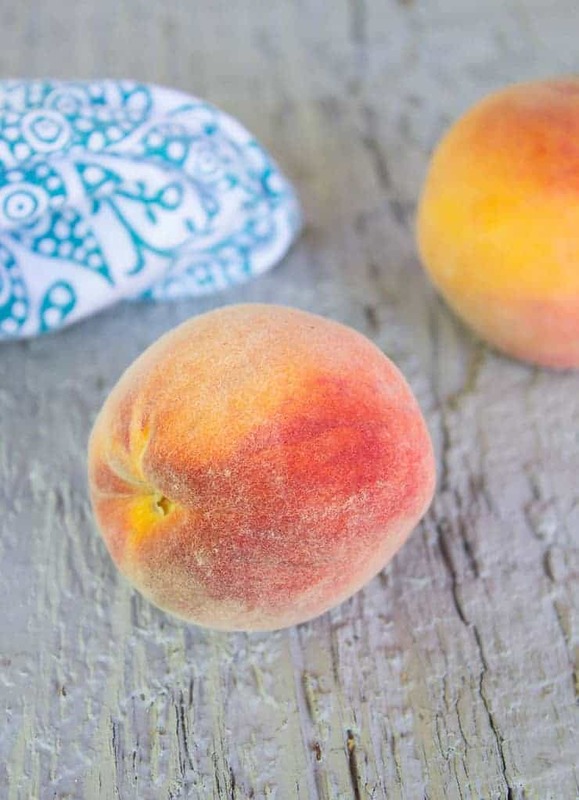 Can I use frozen peaches? For this recipe, you will want to use fresh peaches. It’s worth waiting till they are in season. Just look at all that liquid! That’s liquid gold! It’s nothing but the juices from fresh peaches and a bit of sugar. So much yummy flavor. 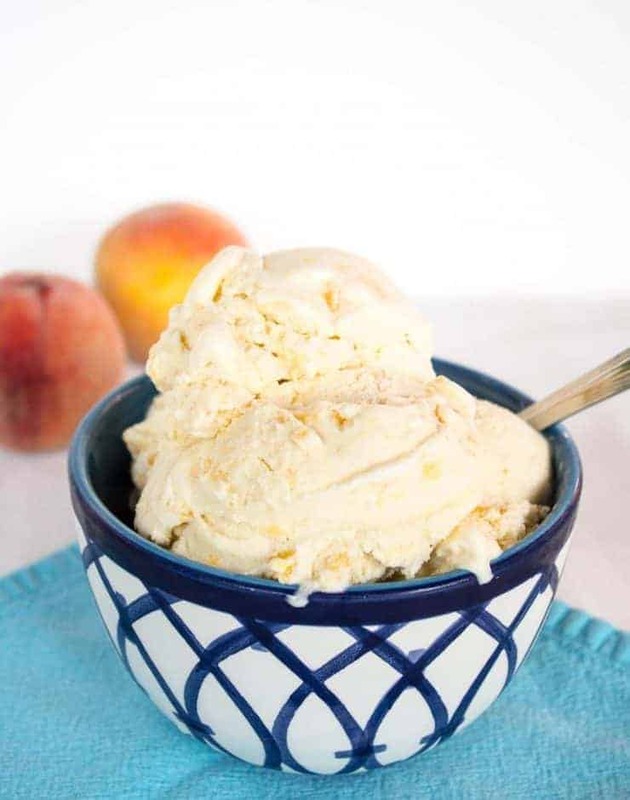 How do you make peach ice cream? This recipe takes some patience. You have to cook the custard, let it cool, churn the ice cream, and then freeze the ice cream. You can eat it directly after churning. I just like my ice cream a little more frozen. The freezing was the hardest part. I kept checking my ice cream to see how it was progressing. It seemed to take forever to go from a “soft serve” ice cream to a “hard serve.” But let me just tell you…it was totally worth it! I used an ice cream maker to churn this ice cream. Just one little piece of advice I’d offer – make certain your ice cream mixing bowl is fully frozen prior to churning ice cream. Trust me, your ice cream just won’t turn into ice cream unless the bowl is really, really frozen! The directions for my mixer says to freeze for at least 12 hours. 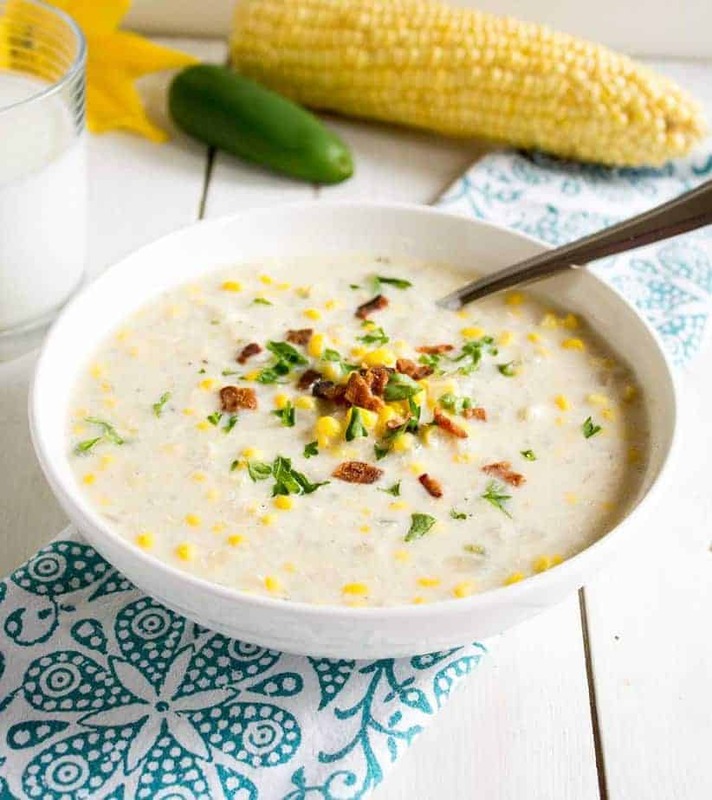 Throw your bowl into the freezer the night before and then you are good to go! This post contains affiliate links. We receive a commission on purchases made via these links. The price you pay is not affected by using them. Sprinkle peaches with granulated sugar. Stir and let sit until sugar is completely dissolved and a peaches have released a large amount of juice. I also make some other delicious frozen treats – Mint Chocolate Chip, Raspberry Swirl, Orange Sherbet and Lime Sherbet! 4 whole medium sized fresh peaches peeled, pitted and chopped. Place peaches in a bowl. Add 1/4 cup sugar and stir. Cove and refrigerate for at least 1 hour. In a saucepan, heat 1 cup heavy cream, 1 cup milk and 3/4 cup sugar and salt. Warm over medium heat, stirring often until the sugar has dissolved, 3 to 4 minutes. In a separate bowl, beat egg yolks. Take 1 cup of heated cream mixture and pour into whisked eggs. Pour in a slow steady stream while whisking eggs. Pour egg mixture back into remaining cream mixture. Reheat over medium heat for 5 to 8 minutes stirring often. You do not want this mixture to boil. Mixture will begin to thicken. You want it to be thick enough to coat the back of a spoon. An instant read thermometer should read 175-180 F.
In a large bowl, pour remaining 1 cup of cream. Place a fine strainer over top. Pour heated custard into strainer. 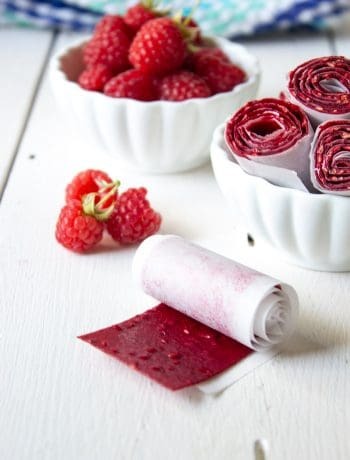 Cover and refrigerate until completely cooled, at least 4 hours or overnight. Strain peaches, reserving liquid. Mix liquid into cooled custard mixture. Place custard into an automatic ice cream maker. Follow directions for ice cream maker. During the last 3-5 minutes of churning, add peaches. Remove ice cream and place in freezer. The chopped peaches turned into ice chunks in the mixture. Is there something I’m doing wrong? Hi Katherine, I’m so sorry that this ice cream didn’t turn out for you. The peaches shouldn’t be ice chunks. 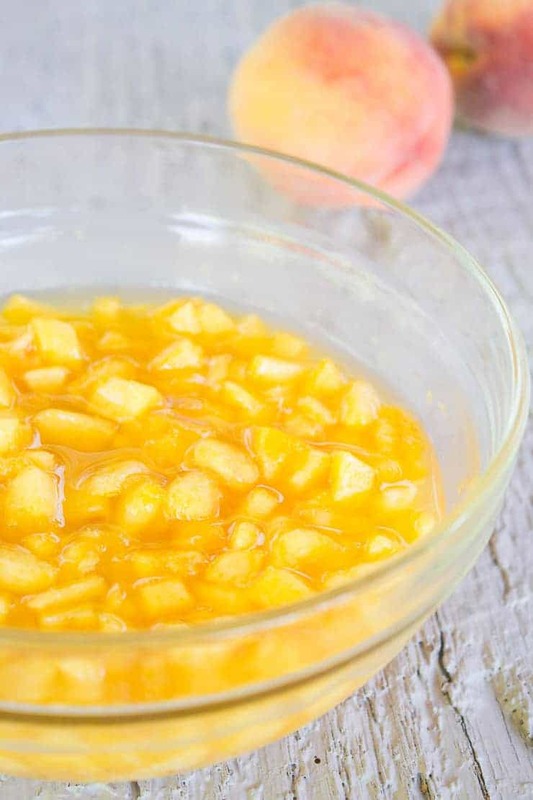 Did you soak your peaches in sugar for at least an hour before adding to the custard? This draws out most of the liquid that would cause the peaches to turn icy. Yum! Peach desserts are one of my favorite parts of summer! This ice cream looks delicious! 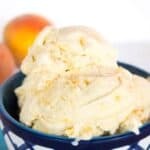 My husband doesn’t like chunks of peaches in his ice cream, could I purée the chunks instead of leaving them in chunks?? Looks great! I haven’t tried to puree the peaches, but I think it should work. Let me know how it turns out! Oh this looks so good, I can’t wait until peach season here so I can have a go at making some myself! Kathy, I love churned ice cream, too. I remember my parents making ice cream when I was a child. My brother and I would watch that thing churn away and tell my father when it was time to add more salt. It was a very important, job, you know! Peach ice cream is my father’s particular favorite. I’ll need to surprise him with some. Thank you for the recipe! When we were kids we had a hand crank ice cream maker. It was so tough to turn it towards the end. Peach season is in full swing here. WE are just shy of the Georgia Border and I have to tell you South Carolina produces amazing peaches. Fresh peach ice cream hits the spot here in hot and humid Florida. I think I need to visit the south just for the fresh peaches! I’ll bet they are amazing. Awww, this recipe just takes me back to the good old days. Ok, I’m only like um near 40 so I don’t know what I’m talking about. 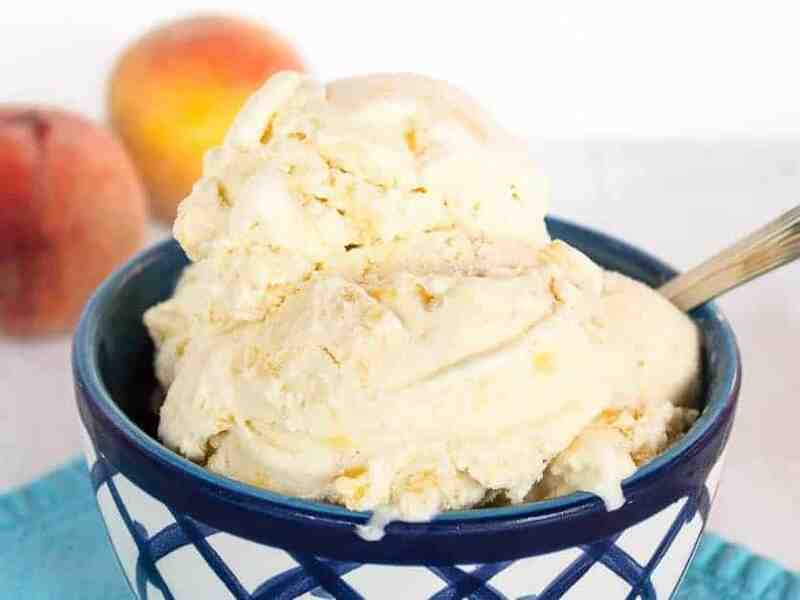 But anyhow, old fashioned peach ice cream sounds delightful! 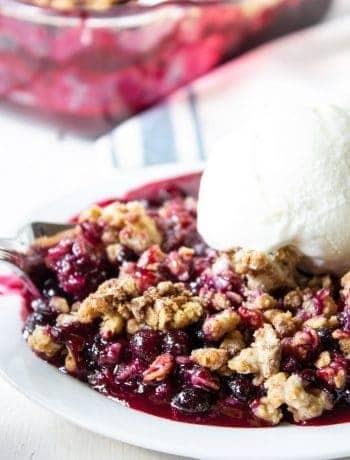 The good old days don’t have to be that far back 🙂 This recipe is just plain delicious! I would not mind a huge double scoop of this peach ice cream. I have to make another batch….we already ate it all! yum, sounds delightful! I love peaches! Peach is my second favorite fruit, next to mango and this ice cream look so yummy! Mango ice cream would be super yummy! The “Peach Man” keeps me loaded with fresh fruit in the summer! I need to experiment with more flavors. Right now, peach is our favorite! Peaches are my all time favorite summer fruit – no contest! – and this ice cream looks like sweet peach perfection! I haven’t been able to pick just one favorite. I love to sample so many different fruits! Girl, you have way more patience than I do. I love the custard approach and this ice cream looks fantasitc! Liquid gold, that’s for sure! Wow, this ice-cream looks delicious! What a perfect way to make use of one of the Summer’s best fruits 🙂 Can never go wrong with ice-cream 🙂 Pinned! Peaches are so juicy and that juice has so much flavor. Wow Kathy! Peaches are a summer favorite! I’ll definitely be giving this one a try! Happy 4th! This ice cream disappeared quickly in my house. I need to make another batch. Thank goodness for the Peach Man! Grab those peaches while you can- I know that cherries are only in season for a short time, too! My favorite part of the ice cream making process is the ‘soft serve’ stage, before you freeze it. I could eat the entire container of ice cream in one sitting!